One of the first projects I did when I bought my house was fixing up the lawn and landscaping. When I bought the house, the front garden was pretty overgrown with large pine bushes that just looked dated and messy. My goal for the project was to visually clean up the space, add some more color, and make it easier to maintain. The first step was removing the pine bushes. They had pretty large roots, so Dad came up with the idea to wrap a rope around them and hoist them out of the ground. It worked really well and wasn’t as labor intensive as digging them out by hand. As plants started coming up in the spring, I decided what I wanted to keep and remove. 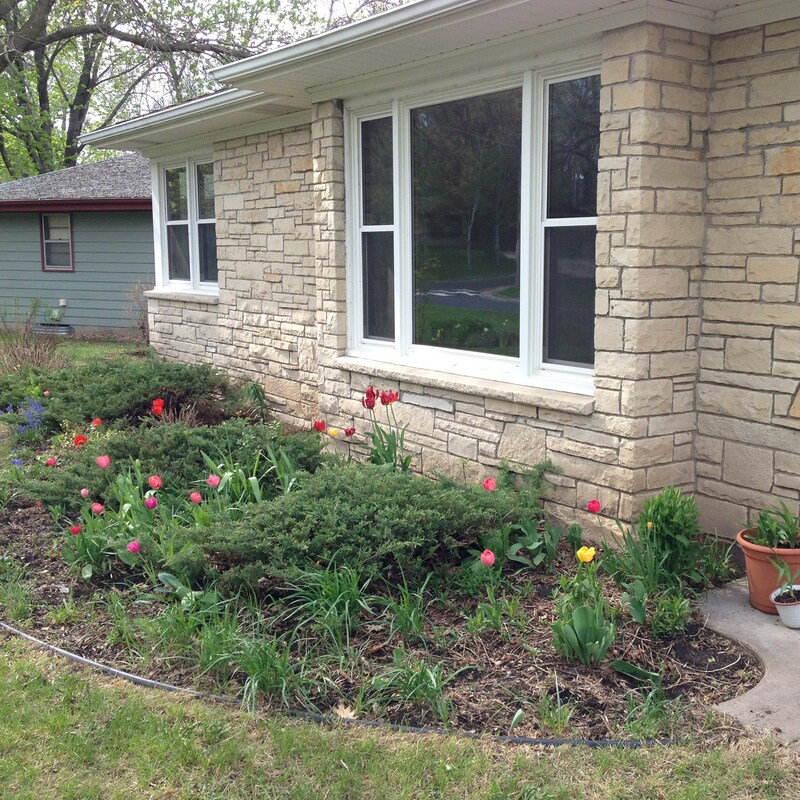 The garden is filled with colorful tulips that I wanted to keep, but I removed a lot of the taller plants that were growing in the front and added visual clutter. After some pinterest-searching, I decided to add blue hydrangeas and pink rose bushes to take place of the old pine bushes. I love the color of blue hydrangeas, and although they are a little hard to care for, the beautiful color makes them worth it. Along the front of the garden, I added a pattern of hastas and colorful annual flowers. I like hastas because they’re almost impossible to kill, and give a clean look to the garden. The final step was to add red mulch to the entire garden which helps prevent weeds and adds color to the space. Now the garden is much easier to maintain and has color all spring and summer. How pretty are those tulips! ?